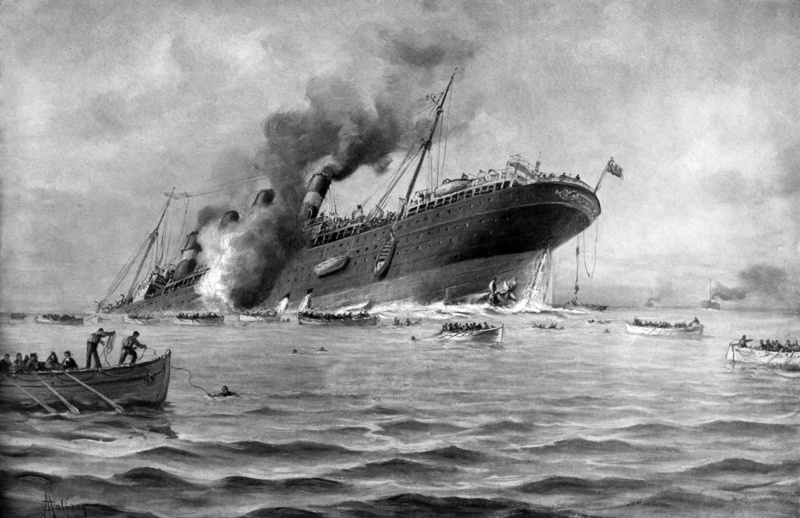 Sinking British passenger ship Lusitania, torpedoed without warning in 1915 by a German U-Boat, off the Irish coast. Great Britain was at war with Germany, but the United states was neutral. One hundred and twenty-eight Americans were killed. America was outraged. 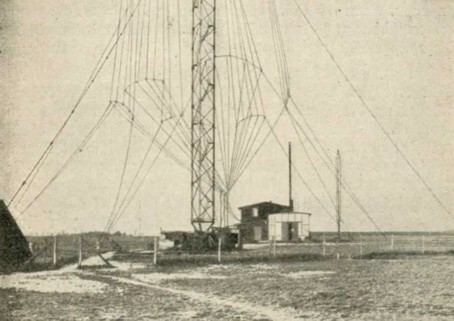 World War I German transmitting station. One hundred years ago, in 1917, a secret coded radio transmission from a German transmitter was intercepted by British Intelligence. Great Britain was already at war with Germany. Despite the loss of American lives on the Lusitania, United States President Woodrow Wilson was struggling to keep America out of World War I. 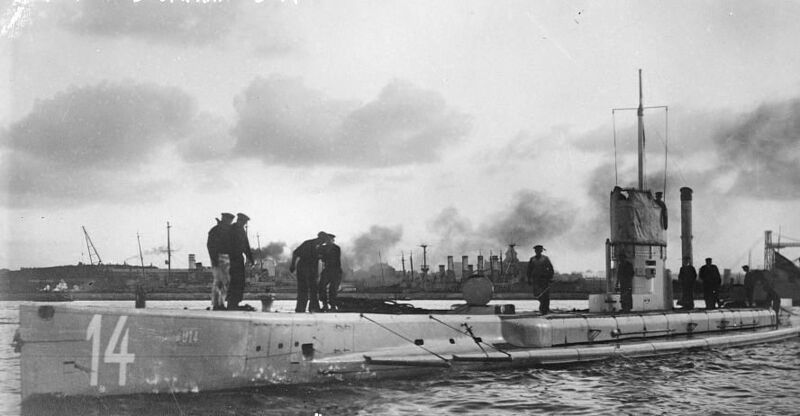 World War I German submarine. German submarines were attacking unarmed merchant ships crossing the Atlantic to prevent food and war materials from reaching England. Urgent German message in secret code. The coded radio transmission, one of many, passed into Room 40 of the Admiralty Old Building in London. Two years before this telegram was intercepted, a copy of the top secret German Handelsschiffsverkehrsbuch had been retrieved from the safe of a German destroyer and had found a welcome home in Room 40. It was the handbook of the German secret code. 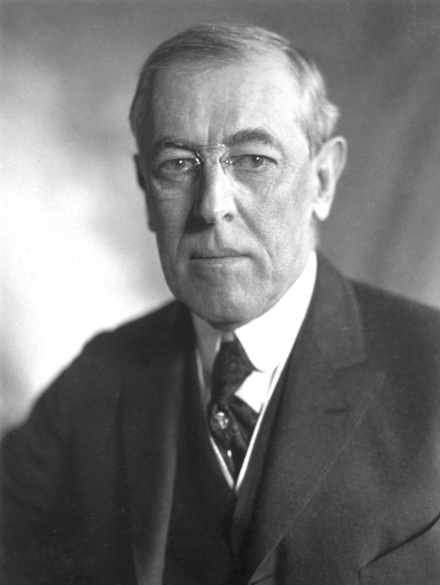 United States President Woodrow Wilson. President Woodrow Wilson struggled to keep the United State neutral in the war, to “keep an even Spirit.” Entering a war with Germany would be a dangerous undertaking when Germany had not directly threatened the United States. 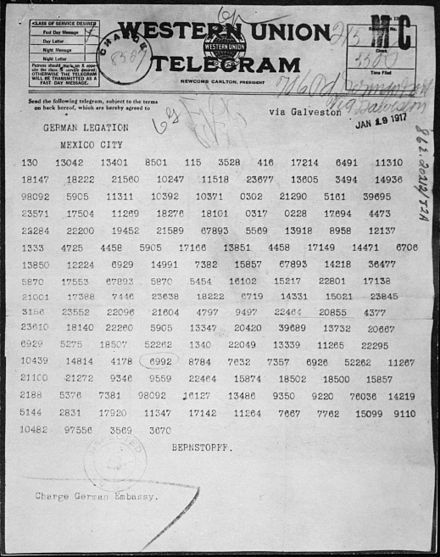 When British Cryptographers decoded the German radio transmission, they were stunned by its content. The message was so completely self-serving to British interests in involving the United States into their war, they were almost afraid to show it to the United States Ambassador, James W. Gerard. They were also reluctant to reveal it because it would signal to the Germans that the British had unlocked their codes. The content of this message was breathtaking; it was sent from German Foreign Secretary Arthur Zimmerman to Erich von Eckardt, German Ambassador to Mexico. 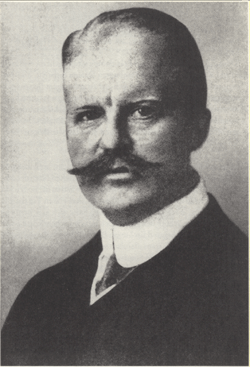 German Foreign Secretary Arthur Zimmerman. “We (Germany) intend to begin on the first of February unrestricted submarine warfare…we shall endeavor in spite of this to keep the United States neutral. generous financial support and an understanding on our part that Mexico is to reconquer the lost territory of Texas, New Mexico and Arizona. The settlement detail is left to you. You will inform the President (of Mexico) of the above most secretly as soon as the outbreak of war with the United States of America is certain…. 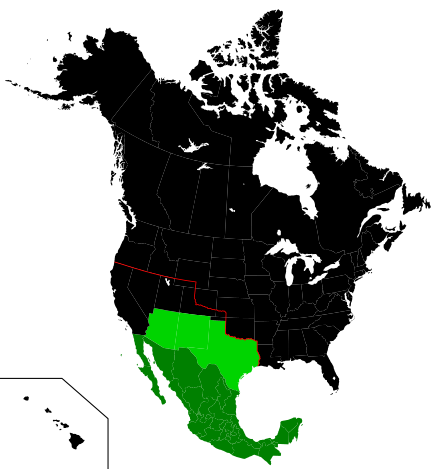 In Light Green: US States Texas, New Mexico and Arizona, Mexico’s proposed reward for supporting Germany in World War One. President of Mexico Venustiano Carranza. Germany probably hoped to take advantage of the revolution in Mexico, knowing that the United States relationship with Mexico was rocky at best. However, the US did recognize Venustiano Carranza as the legitimate President of Mexico. 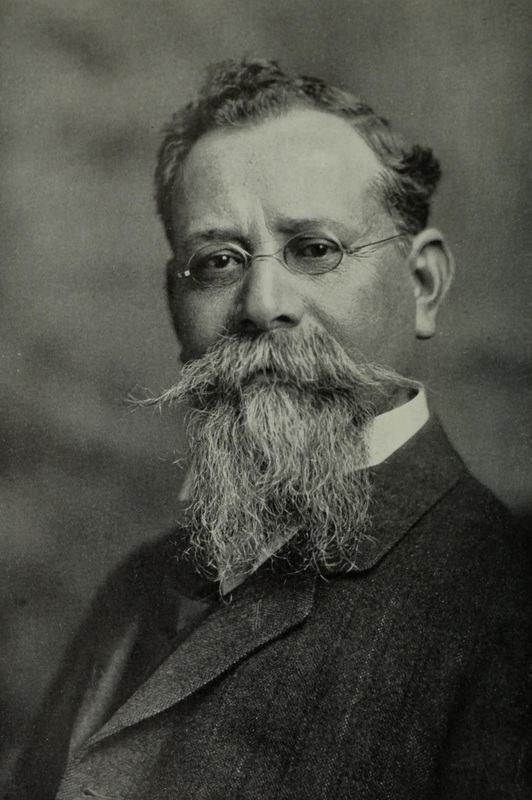 A Mexican military commission appointed by Carranza studied the German proposal and eventually rejected the offer. Mexico/United States relations continued to be strained during this time. Mexico remained totally neutral during World War I, even allowing German companies to operate businesses within Mexico. 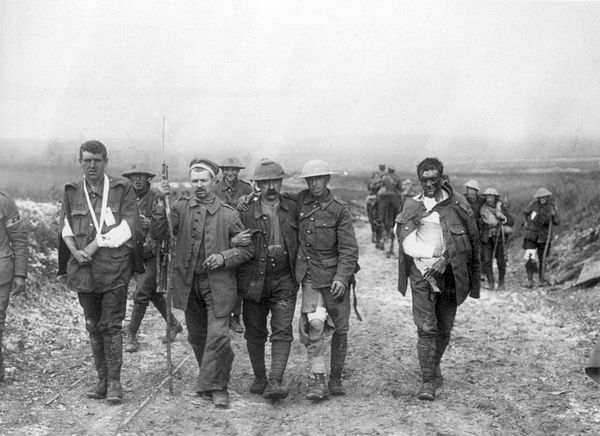 British wounded at Bernafay Wood, July 1916. England needed extra soldiers for its army and Americans, some believing in the cause and some just seeking adventure, volunteered. The French, just beginning to develop their air force, especially needed educated men to become pilots and fly air sorties over the German line on the Western Front. James Norman Hall in 1917. 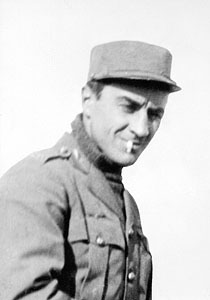 One of the Americans, who volunteered to join the new French Lafayette Escadrille Flying School was James Norman Hall. Hall was 29 years old at the time and looking for adventure. Later in life, he would become the co-author of the world famous book “Mutiny On The Bounty,” as well as other South Seas adventures. 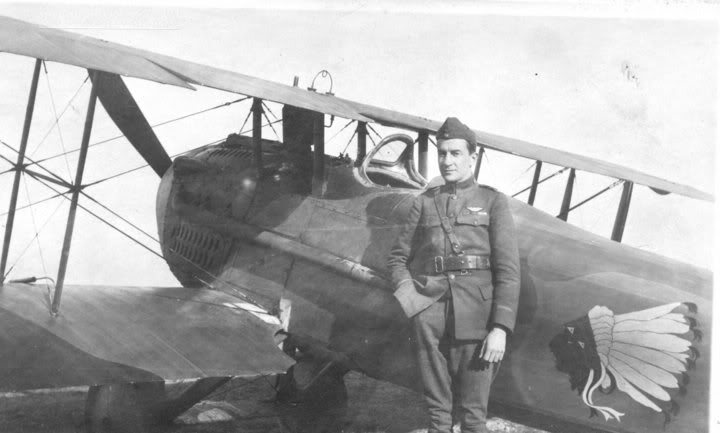 James Norman Hall and his World War I bi-plane. James Norman Hall learned to fly primitive bi-planes and engage in the original form of air dogfights and battles. He wrote about his unique and hair raising experiences in his book “High Adventure,” which I have published as a Listen To Read audiobook, with actor Andre Devin portraying Hall. As you might imagine, it was quite an experience!